I recently developed a recipe for Napa Valley's own Mezzetta: my Antipasto Salad with Peperoncini Olive Tapenade. Make sure to check it out—and also enter Mezzetta's exciting giveaway of 52 dinners for two delivered to your home ($1560 value!). It's a foodie's dream. I'm thrilled that my relationship with this family-owned company continues, with an invitation to a marvelous dinner party! It kicked off with this fabulous invitation, which included a jar of Mezzetta's famous peperoncini and a small cheese board. How cool is that? I was definitely ready to Brighten Every Bite with Mezzetta. The fabulous invitation gave me a clue that this would be no regular dinner party. And I was right. I arrived at a beautiful home in a beautiful neighborhood with a beautiful table. It felt like I'd been transported to Tuscany! This wasn't some cold corporate event, either. Yes, there were some food bloggers there to document it, but the majority of the guests were people from the neighborhood. And though they all lived in the same place, it turns out most of them didn't know each other. 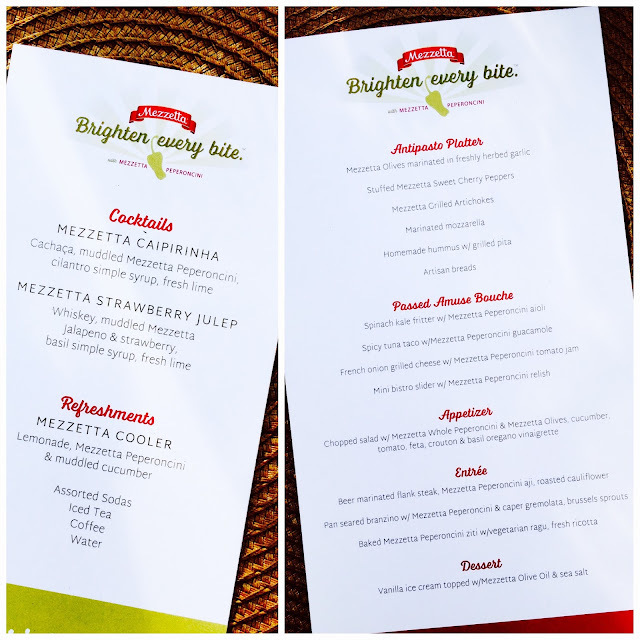 This dinner gave them a chance to meet, mingle, and share a meal together. There's not enough of that these days, is there? The table was set with gorgeous flowers, heirloom tomatoes, and jars of Mezzetta peperoncini! Ain't no party like a peperoncini party! In fact, there were peperoncini everywhere—and in everything! Drinks included a Mezzetta Caipirinha (flavored with muddled peperoncini) and a Mezzetta Cooler, made with fresh lemonade, peperoncini, and muddled cucumber. Bet you never thought to use peperoncini in your cocktails, right? But cheers to it because they were delish. If you ever have a few peppers left in your jar and you're not sure what to do with them...think drinks! Wouldn't a few peperoncini be fabulous in your next Bloody Mary? Once we had drinks in hand, it was time to tackle the phenomenal antipasti platter. I mean, I could've made a meal out of just these goodies: hummus with grilled pita; fresh honeycomb; Parmigianno Reggiano, feta, and marinated mozzarella; cured meats; and Mezzetta's own olives, stuffed sweet cherry peppers, and grilled artichokes. There were also passed hors d'oeuvres that incorporated peperoncini in creative ways, like these tiny tuna tartare tacos with Mezzetta peperoncini guacamole. That guac was insanely good, it blew my mind. The pickled peppers added a tangy heat that brightened the guacamole in a delicious way. When we sat for dinner, celebrity Chef Michael Psilakis talked more about the themes of the evening: making memories with delicious food; showing you care for people by cooking for them; bringing a community together and getting to know your neighbors over a shared meal. Of course, the event also highlighted Mezzetta's wonderful peperoncini—which are more versatile than you might think. Chef Psilakis and Laura Vitale (of Laura in the Kitchen) talked us through the night's menus that creatively featured the crunchy, tangy, not-too-spicy star of the night. We started with a salad with Mezzetta peperoncini and olives, as well as corn, tomato, feta, and basil vinaigrette. For my entree, I had a beer marinated flank steak topped with peperoncini aji (similar to a chimichurri) sauce, roasted potatoes, and cauliflower. Dessert didn't have involve any peperoncini (wouldn't that have been something?!). But it did feature beautiful Meditterranean ingredients: vanilla ice cream topped with drizzles of fruity extra virgin olive oil and sweet balsamic syrup. So refreshing on a warm summer night! It was a beautiful event. And it was so lovely to meet new people, learn about inventive recipes, and enjoy the flavors of the Mediterranean right near my own home. And I got what was possibly the best "goody bag" ever! 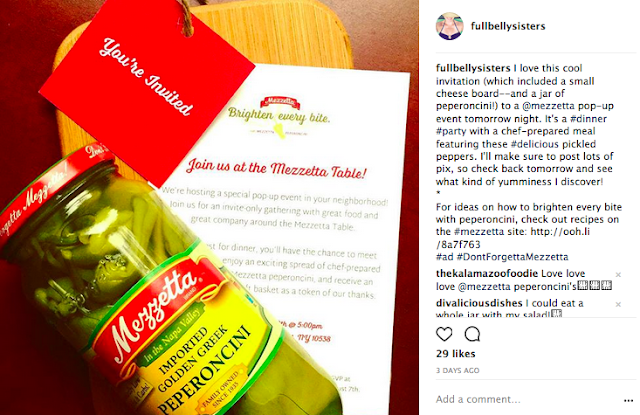 A giant crate filled with jars of delicious Mezzetta ingredients (olives, peperoncini, jalapenos, pasta sauce, and roasted red peppers), as well as a Mezzetta apron and a gift certificate for Chef'd—a gourmet meal delivery service. What an amazing haul! 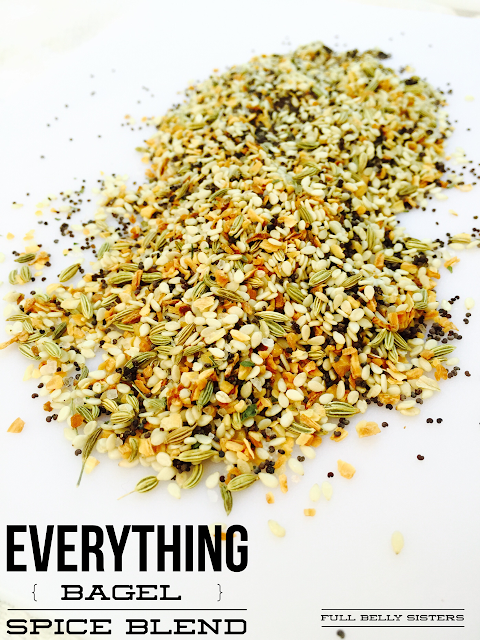 Don't forget to check out Mezzetta's site for loads of creative ways to use peperoncini in your own kitchen. And make sure to enter the giveaway for those 52 gourmet meals delivered to your home from Chef'd—a prize valued at $1560!